Throughout 2012 we are sharing an illustration with you every week to help you to re-imagine the future that you choose. 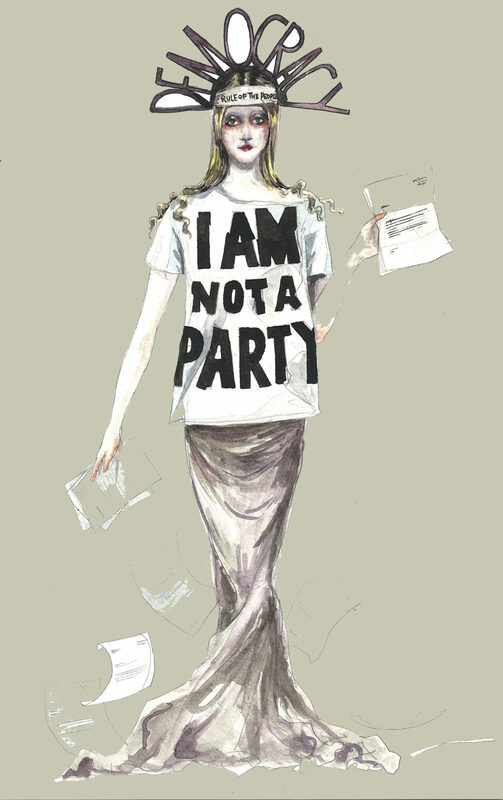 For the sixth week of 2012, we are sharing iconic Fashion Designer, Katharine Hamnett’s Future. I would like to see a future where we had the dictionary definition of democracy, government by the people, for the people and tolerating minority views. Politicians are a vested interest group only in politics to get re-elected, we should let them know by letter and email what our views are and tell them that if they don’t represent our views in parliament we wont vote for them next time.We need to get our elected representatives to represent the majority view of there constituency on every issue, no more towing the party line and being forced to vote with the government.We can do this by having national and constituency referenda and a civil service to implement them and administer the country according to the results.If we had had this, we wouldn’t have had an illegal war in Iraq, with thousands of innocent lives lost. We wouldn’t be cutting much needed A&E’s. We wouldn’t be having to cut child benefit so we can pay bankers bonuses. Its our country and we as citizens should decide how its run, its our money, we should decide how it is spent. We can use our vote to get the country we want. The first line of Hamnett’s future really rang true for me. I have no faith in our Government or many other countries’ Government for that matter. They do not seem to ever act in the interest of everyday people, or listen to them. I wanted a figure in my illustration that represented Democracy ; like the Statue of Liberty, or Justice reminds us of a value. I also wanted a nod to Hamnett’s slogan Tshirts and say something about there being too much emphasis on which party is in power.